Orbus Coyote Displays and Accessories by New World Case Inc. Premium Coyote Displays and Accessories from New World Case, Inc. Based in MA, 50 miles outside of Boston, we have over 35 years of trade show display and custom case building experience! 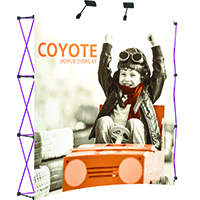 Portable Coyote Displays and Accessories for all your Trade Show and Event needs! Full Displays in all sizes, Shipping Cases, Replacement panels and graphic panels. Choose from Lighting, Case-to-Counter Conversion Kits, Shelf Kits, and Monitor Kits to customize your Pop Up Display and maximize your presence at all your events! 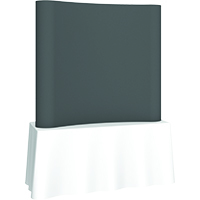 Give your Coyote Tabletop Display a new or alternate look with new Fabric or Graphic panels!